This applies to everybody, but especially for those who suffer from Mould Illness/Chronic Inflammatory Response Syndrome (CIRS). 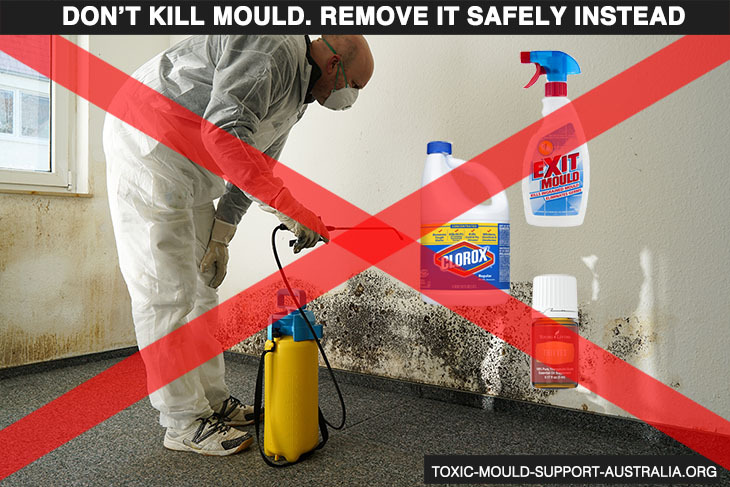 Don’t kill mould, safely remove it instead. 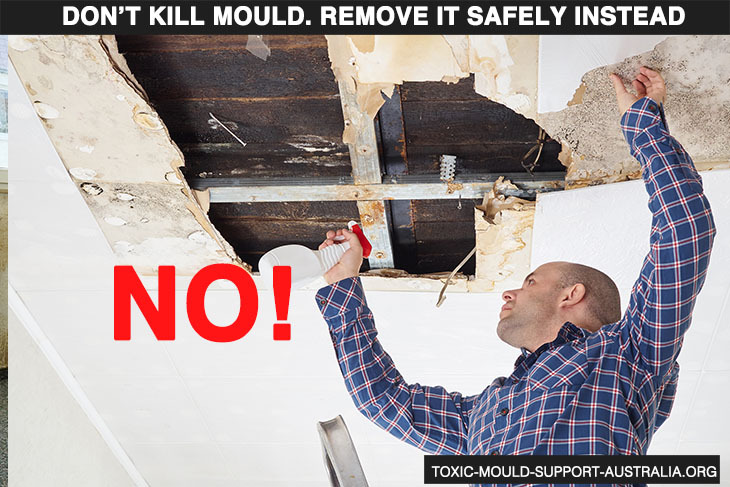 Why don’t you want to kill mould? Mould spores and hyphae (roots) will fragment into hundreds of toxic particles when killed. When inhaled these ultrafine and nano particles, and the toxins residing on them, trigger the innate immune system which sees them as Pathogen-associated molecular pattern (PAMPs) and Damage-associated molecular pattern (DAMPs) (Source: Berndtson, K. (2016). Biotoxin Pathway 2.0). Killing mould spores can also make them produce more mycotoxins and other defense mechanisms such as microbial VOCs as they die. So in all respects you actual increase the toxin and inflammagen load when you kill, rather than remove, mould. Substances that kill mould and other microbes are known as antimicrobials or biocides. There’s a huge disconnect between Indoor Environmental Professionals (IEPs) and mould remediators who follow best practice industry standards and most news or blog articles on the internet and many government agencies, even those quoting mycologists and other “experts”. What is a water-damaged building? The caveat here is that if you have more than a small amount of surface only mould growth then you should consult with an IEP and if required a professional remediator. 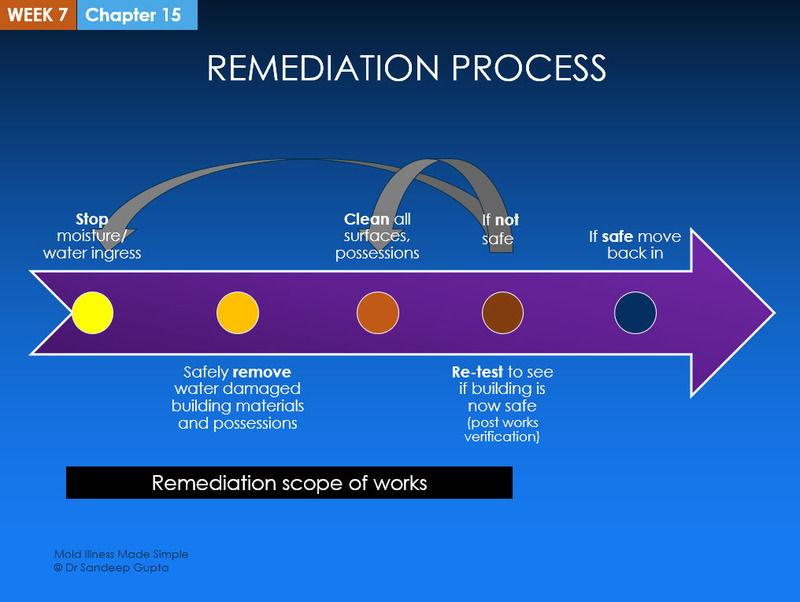 An IEP will write up a remediation scope of works for the remediator to follow. Make sure the IEP/remediator follow the IICRC S520 at a minimum and give them the Surviving Mold IEP consensus statement for them to follow. See the References section for where I’ve sourced my information. If porous buldings materials are water-damaged and/or mouldy they will need to be removed and disposed of safely, using containment that can include plastic sheeting, negative air pressure and HEPA air scrubbers. These materials may need to be replaced, generally after the remediation process. Porous materials include gypsum wallboard (drywall), ceiling tiles, exposed particleboard/MDF. Semi-porous and non-porous materials such as solid wood, vinyl, floor tiles, cement and more may need special remediation techniques to physically remove the mould such as wire brushing, air blowing, freezing etc. This process is for all surfaces – ceilings, walls, floors and cupboards/wardrobes – except carpets, which is a whole other blog post. Make sure surfaces are fully dry before going to the next stage. HEPA vacuums are known to perform poorly with small electrically charged particles; HEPA must not be used to clean surfaces after wiping. 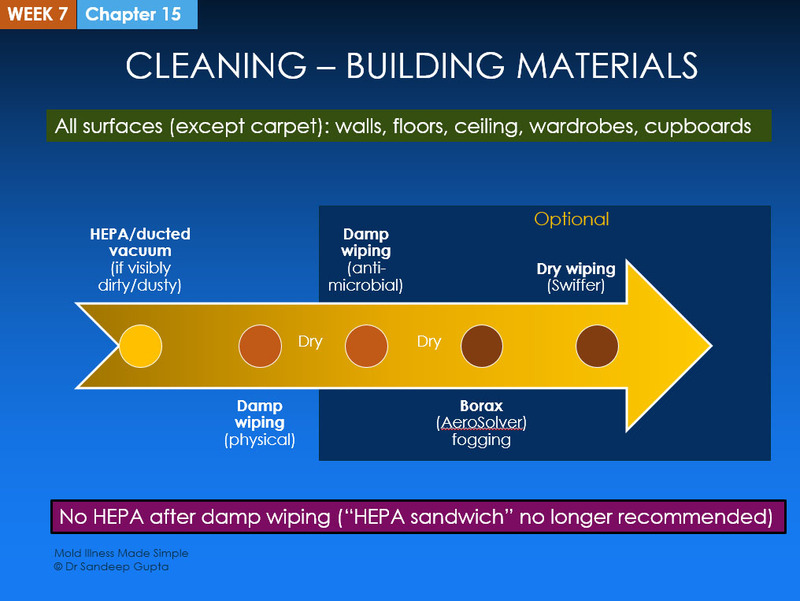 Surfaces should only be vacuumed if they have visible dust that can’t otherwise be moved with compressed air outdoors (example: furniture) or in a containment area within the capture zone of a HEPA air scrubber vented to the exterior. The aim here is to use a mild surfactant that, one that doesn’t leave a residue, to physically remove mould from surfaces. This could be castile soap and water, or dish wash liquid and water. Change the cloths regularly and don’t wipe back and forth or in circles, wipe in one direction. If you have, or suspect, bacterial contamination this is where you can use an antimicrobial/biocide. Ideally use isopropyl alcohol or ethanol (wood grain alcohol) diluted, 10% alcohol to 90% water. Some remediatiors may suggest vinegar (80% vinegar, 20% water), hydrogen peroxide, Napisan (1 cup to 6L), or quats at this step. The remediator Greg Weatherman who co-authored the consensus statement and has written chapters in Dr. Shoemaker’s books Mold Warriors (2005) and Surviving Mold (2010) has developed a borax fogging solution, AeroSolver, that can trap ultrafine particles down to 0.01 microns in size. The AeroSolver is fogged in a building, using protective clothing, then dry wiped. Best practice is for both the remediator and IEP to retest. There’s a couple of catches here; the majority of professionals will re-test using a combination of tape lifts and air sampling not ERMI/HERTSMI-2 and if they/you go that route you’ll have to wait 3-4 weeks for enough dust to collect on surfaces using the Swiffer collection method. There are several problems with biocide sprays or solutions, such as Exit Mould, chlorine bleach, hydrogen peroxide and more. The main one of course is that they kill mould which we don’t want. Additionally they can be toxic when inhaled and add moisture to the building materials which itself feeds mould growth. Bleach/Exit Mould (Sodium hypochlorite) only superficially strip away the colour of mould and consumer grade products are rarely in a high enough concentration to actually kill it. None of these will work on porous materials. Ah yes everybody’s favourite. It’s natural so it must be good, right? The use of vinegar, usually diluted to 80% white vinegar / 20% is controversial. The Australian Mould guidelines (2010) and many remediators support its use, and it is at least non toxic compared to bleach. The bottom line is that it’s still an antimicrobial that kills mould. Clove oil, thieves oil and tea tree oil are popular in the mould community but they are generally not recommended as not only do they kill mould the oil can provide food for future mould growth. Quaternary ammonium compounds, such as diluted Windex, are recommended by Dr. Shoemaker in his books Surviving Mold and State of the art answers to 500 mold questions. They may have the ability to bind toxins but are considered antimicrobials. 12.2.1 Remediators should not mist or fog disinfectants or sanitizers in an attempt to kill mold in lieu of source removal. If you’re an CIRS patient, any mould removal should done by someone else, ideally a professional. In fact be out of the house/building while remediation is taking place. Wear personal protective equipment. Wear an N-95 respirator at a minimum, goggles, and protective gloves. …AFTER YOU LEAVE A MOLD SITE: Protect yourself and loved ones. Shower and change your clothes. This will help you avoid carrying mold and other hazards back to your current living quarters. The main documents I’ve drawn from are the industry standard ANSI/IICRC S520 Mold Remediation Standard/Reference Guide (2015) and the Surviving Mold IEP Panel Consensus Statement (2016) . IICRC S520 says numerous times that removal of mould, rather than killing, is required in mold remediation, e.g. Source removal of mold contamination should always be the primary means of remediation. Indiscriminate use of antimicrobials, coatings, sealants, and cleaning chemicals is not recommended. Killing or suppressing mold growth will not address the adverse health effects caused by other microbial components such as endotoxins, exotoxins, beta glucans and mannans, among others. It is folly to advocate use of antimicrobial compounds as the “remedial solution” when the inflammagens, toxins and antigens are still present even if the mold itself is “dead.” Removing all toxigens and inflammagens, not simply focusing on killing what is or isn’t alive, is the only route to successful remediation. A common misperception is that killing mold, which is a relatively easy task, eliminates risk from contaminated environments or items. 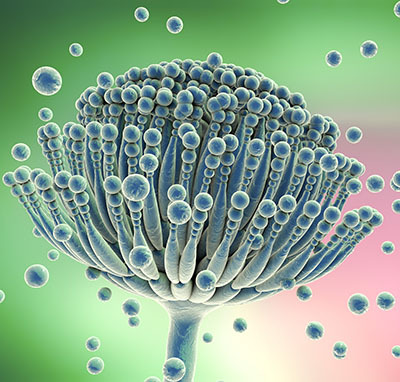 Unfortunately, this does little to decrease the risk as nonviable fungal spores, fragments, and mycotoxins remain present and, due to their structure, such as with an epoxide ring,  they can be extremely difficult to destroy. Biocides are substances that can destroy living organisms. The use of a chemical or biocide that kills organisms such as mold (chlorine bleach, for example) is not recommended as a routine practice during mold cleanup…Dead mold may still cause allergic reactions in some people, so it is not enough to simply kill the mold, it must also be removed. Place mold damaged materials in a plastic bag and discard. Clean mold off hard surfaces and other nonporous materials with detergent and water, and dry completely. Cleaning should be done using a soap or detergent solution. Use the gentlest cleaning method that effectively removes the mold to limit dust generation…Disinfectants are seldom needed to perform an effective remediation because removal of fungal growth remains the most effective way to prevent exposure. Would you like to learn more about mould remediation and building testing? 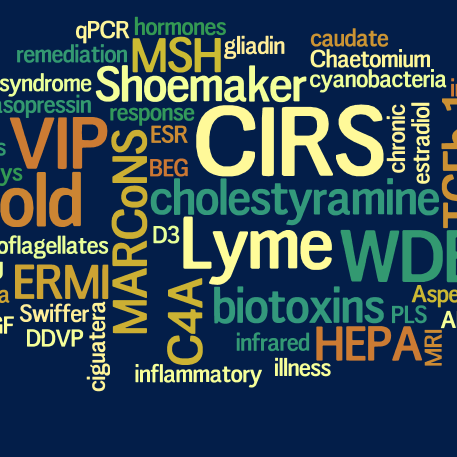 How about the diagnosis and treatment of CIRS and how Lyme and other tick-borne infections fit into the picture? Dr. Sandeep Gupta and myself have developed an eight week online course called Mold Illness Made Simple that covers all of these things and more in an easily digestible format. The course has hundreds of slides like the ones above, plus video lectures, high quality PDF workbooks, access to a secret Facebook group and private webinars.